The biggest mistake (and one that is made over and over again) every political party has made as soon as they are elected is to forget who they really are. That they have come to power because of the people's mandate, that they are representatives of these people and so their only job is to serve the interest of the people-- these truths completely elude ruling parties as soon as they form the government. And as we know from experience, governments like to keep everything secret from the public they are supposed to be serving. This culture of secrecy is a universal phenomenon, which is why many democracies of the world have wizened up to the reality that transparency is not a given attribute of a democratic nation, but something that often has to be ensured by law. Many western democracies not surprisingly, have recognised the public's right to information as a fundamental prerequisite to a transparent, accountable government. It paves the way for an environment in which every citizen has the right to access information regarding any activity, decision, policy etc. carried out by the government, with a few exceptions. Sweden included the Freedom of the Press Act 1766 in its constitution and is perhaps the first ever piece of freedom of information legislation, Finland's Law on Public Character of Official Documents was passed in 1951 and Denmark and Norway got their versions passed in the 70s. The US adopted its Freedom of Information Act in 1966 and the UK as late as the year 2000 with its actual implementation in 2006. India passed its Right to Information Act in 2005 and it is in keeping the Indian document as a model that a draft has been formulated for Bangladesh. A recent roundtable organised by Manusher Jonno, an NGO specialising in promoting human rights and good governance, invited Wajahat Habibullah, Chief Commissioner, Central Information Commission of India, to talk about how India's RTI Act came about, how it works, its limitations and how our own draft compares with its Indian counterpart. The roundtable also brought together an interesting mix of government officials, leaders of major political parties, journalists and other members of civil society. The 'right to information' movement in India, explains Habibullah, began much before the Act became law and there was generally a public involvement at every stage. There were also other important developments in the country that created the atmosphere for the Act to be passed. In the early 80s, massive poverty alleviation programmes brought poverty levels down by 50 percent. In the late 80s, an information revolution took place and in the 90s there was a withdrawal of government monopoly in information and broadcasting. People also started questioning the development work carried out by the government, something that they had always been told was confidential information. Finally initiatives of civil society led to the Free Media-Freedom of Information Act 2002 and ultimately the Right to Information Act, 2005. 'Information' includes any material in any form-- records, documents, memos, emails, advices, circulars, reports, papers, data etc related to any private body which can be accessed by a public authority under any other law for the time being in force (Section 2 (f) RTI Act 2005. In the Bangladesh draft of the Act, the right to information gives every citizen the right to apply for or request information regarding decisions, written proceedings or complete or proposed activities to be completed by the authority. It includes 'taking extracts, obtaining photocopies or certified copies of documents or records, taking certified samples of materials, obtaining information in diskettes, floppies, video cassettes or any other electronic mode or through printouts where such information is stored in a computer or any other device'. While a citizen may have the right to information, getting actual access to this information is another matter. In the Indian Act, the government has the corresponding duty to meet the request except the exempted information. It is therefore the duty of the government to pro-actively make available key information to all. In the Bangladesh draft every public authority must publish not less than every two years, all kinds of information such as its functions, responsibilities of its officers and employees, information regarding how a citizen can acquire from the authority any license, permit, grant, allotment, consent, approval and other benefits and so on as well as the name and address of the designated officer to whom application for information is to be made. Section 4 Disclosure of the Indian Act points out Habibullah, reveals a change in thinking that the government, as it represents the people, must reveal any information that it holds. The section fundamentally restructures the debate from what should be revealed to what must be kept secret says Habibullah and reflects the potency of India's vibrant democracy. The Central Information Commission, a body to ensure the proper implementation of the Act, can require a public authority to publish certain information and even impose penalties in case of non- compliance under Section 19. Habibullah adds that the information has to be made widely available, to every corner of the country; putting up the information on the internet (as in India) is an effective way to make sure that it is readily available. NGOs, says the chief commissioner, can help in this regard. 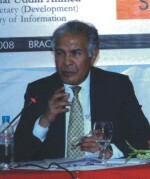 Habibullah lists the exemptions from disclosure as stated in the 2005 Act which includes information that would prejudicially affect the sovereignty of the country or the security, strategic, scientific or economic interests of the state, relation with a foreign state or that which would lead to incitement of an offence. Information that has been forbidden by the court to be disclosed and which may be seen as contempt of court is also under the exemption. Habibullah says that this section of the Bangladesh draft needs to be further detailed to avoid misuse or confusion. The clause 'information that would be contrary to public interest' in the Bangladesh draft for instance, is vague and a little contradictory since the purpose of the act is to serve public interest. So what happens when a person is denied a particular piece of information or if the concerned government official decides to sit on it unnecessarily? The Central Information Commission accepts complaints if the person has been refused information, if the public official has not handled the request properly, if the authority has not responded within 30 working days of the request, if it has not explained why an extension is needed if the information given is not in the form asked for and if the authority has failed to explain the reasons for refusing a request. Officials who fail to provide the information on time or who deliberately give incorrect, incomplete or misleading information, have to pay penalties for each day of delay. In the Bangladesh draft, recovery of penalty and compensation if not paid by the errant official, can be recoverable from the public official's salary or as arrears of land revenue under the 'Public Demands Recovery Act, 1913'. Thus there are plenty of safeguards within the ordinance to ensure that a citizen can get the information he or she requires within a reasonable amount of time (20 days for a normal application and 48 hours if it concerns the life or liberty of a person). The draft in keeping with the Indian model, stipulates that the cost of obtaining information must be reasonable and cannot exceed the actual costs such as making photocopies or taking print outs. India's Act allows for the fees to be completely waived for people below the poverty line. There is little argument that the Right to Information Act if it is passed, will be a revolutionary step for Bangladesh which has been ravaged by corruption, discrimination and favouritism of government officials. Ordinary people have always suffered, being denied the most basic public services which their tax money pays for. The act will give people the right to know how public money is spent, why a road has not been repaired, why there is no water in the tap, why public lands are being given to relatives of officials rather than rightful recipients, why a duplicate passport is taking so long to be issued and so on. In India, poor citizens have used the Act and the results have been remarkable. It is obvious that it will be a long and bumpy road before our own draft of this act becomes a reality and is effectively used. At the roundtable, actor-turned politician Asaduzzaman Noor pointed out that the present government while deliberating on the issue of this Act, seemed shy about discussing it with any political party. He added that ultimately it will be the parliament that will pass such an Act and so it is important that political parties are involved in the discussions concerning the draft. The Act, if sincerely implemented by the next elected government will be a huge leap forward in the journey towards a corruption-free, socially just, transparent democracy. For the ordinary citizen the Act has the potential of being the ultimate weapon of empowerment.